Enter Jepperd, a violent, hulking drifter who soon takes in Gus and promises to lead him to “The Preserve,” a fabled safe-haven for hybrid children. Along the way they’ll have to contend with science militias, deadly scavengers, rival bounty hunters, and hybrid worshipping cultists as they fight to make it to safety and solve the mysteries of this deadly new frontier. This bizarre and haunting new series is boldly written and illustrated by Eisner-nominated creator Jeff Lemire and elegantly colored by fellow Eisner nominee Jose Villarubia. A little boy with antlers, a big man with guns, a world without hope – SWEET TOOTH #1 ships in September for only $1.00! Yes, only $1! Jeff Lemire is very talented. You can risk a buck to check this comic out. Come on, do it already! OK, fine since you’re being so demanding, here’s a 7-page preview to twist your arm. Three bounty hunter siblings blaze a path of death and destruction across the old west. Traveling by moonlight they rip criminals screaming for mercy from their hiding places, but none is ever given. Each bounty is torn, broken, and bled dry before they are delivered dead and payment collected in gold – no silver. The Irons are the most feared bounty hunting killers in the west, but that fear isn’t based on them being the fastest with a pistol or rifle. It’s because they’re the Walking Dead. A lone tortured soul tracks them with vengeance and salvation driving him to end the curse upon his family. Those who he rescues call him savior but those who look upon his twisted and scarred face call him monster. Silas Irons is the only hope his brothers and sister have of salvation from the abominations they’ve become. But even the purity of his heart can’t stop the unnatural rage and bloodlust building in his diseased soul. A black curse turned these siblings into monsters but deep rooted and twisted family history made them into the worst kind of horrors. This year’s biggest supernatural western tale is collected here for the very first time! Written by James Kuhoric (Freddy vs Jason vs Ash), illustrated by Jason Alexander (BPRD), and based on character designs and covers by Jae Lee (The Dark Tower). Dead Irons – 99 innocent souls – 6 undead monsters – 1 shot to save the world. If you like your comics a little bit eery and frightening, check the 12-page preview out at the publisher’s link above. Jason Shawn Alexander must be a scary man in person. When K. Westree arrives at Bellsong Academy, she thinks she’s left her cat-burgling past behind her. But K. soon discovers the school has a mystery of its own, a hidden treasure left behind by its founder, and she’s the only one who has a hope of finding it. As she resumes her cat-burgling in an attempt to discover the school’s secrets, K. begins to question if a normal life is really what she wants. I have unsuccessfully petitioned Richard Sala to mate with me several times. Yes, I realize this is scientifically impossible and inappropriate. You have your dreams, I’ll have mine, thank you very much. Publisher’s Weekly has an 8-page preview for you to drool at. Wipe your keyboards. This high-end hardcover is on the pricy side (and if it feels excessive, keep your eye out for the inevitable softcover edition later in the year) but this is so charming. Skottie Young seemed to resurrect himself as a new artist completely out of nowhere and his new style is so captivating. And writer Eric Shanower is a devout Oz disciple who has released his own Oz-inspired books. L. Frank Baum would be proud. Here’s a 5-page preview along with an interview with Shanower from last November. “Working has been a book, a radio drama, a Broadway musical, and now a gripping graphic novel. I can’t speak for Studs, but I suspect he would have been tickled to see it adapted by a former government file clerk and wage slave, who knows all about working.” –Roger EbertIn the thirty-five years since Pulitzer Prize-winner Studs Terkel’s Working was first published, it has captivated millions of readers with lyrical and heartbreaking accounts of how their fellow citizens earn a living. Widely regarded as a masterpiece of words, it is now adapted into comic book form by comics legend Harvey Pekar, the blue-collar antihero of his American Book Award-winning comics series American Splendor. In Studs Terkel’s Working, Pekar offers a brilliant visual adaptation of Terkel’s verbatim interviews, collaborating with both established comics veterans and some of the comic underground’s brightest new talent. Here are riveting accounts of the lives of ordinary Americans–farmers, miners, barbers, hookers, box boys, stockbrokers–depicted with unsurpassed dignity and frankness. A visual treat with a visceral impact, Studs Terkel’s Working will delight Terkel fans everywhere, and introduce his most powerful work to a new generation. As the economy continues to threaten the middle-class, this is a great way to take an unfiltered look at the middle-class of 1974, to see how far we have (and haven’t) come. Includes contributions by Pablo Callejo, Gary Dumm, Danny Fingeroth, Peter Gullerud, Bob Hall, Ryan Inzana, Sabrina Jones, Peter Kuper, Terry Laban, Dylan Miner, Pat Moriarity, Emily Nemens, Joan Reilly, Sharon Rudahl, Nick Thorkelson, Anne Timmons, and Lance Tooks. Edited by Paul Buhle. Sadly I can’t find a preview of this book online. If anyone knows of one, post a link in the comments or email me. Danger! Intrigue! Stupidity! locks up a collection of crazy clashes between those two bumbling MAD Spies! 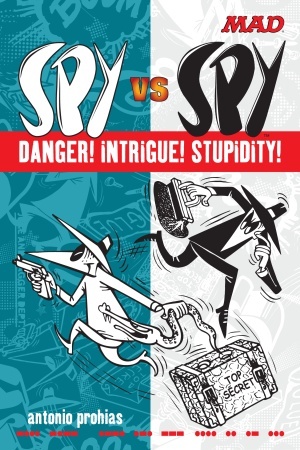 “Spy vs. Spy” was the brainchild of Cuban-born political cartoonist Antonio Prohias, who fled his country after receiving death threats from Fidel Castro. Prohias settled in America, and in 1960 he began a 26-year run of Spy misadventures in MAD Magazine. This book by Prohias, long out of print, showcases his genius as an artist, storyteller, and graphic designer. Classic fun and great for kids! If you enjoy this, there are two other books that have also been released, and have similar cover designs. The prize-winning children’s author depicts a childhood from hell in this searing yet redemptive graphic memoir. One day David Small awoke from a supposedly harmless operation to discover that he had been transformed into a virtual mute. A vocal cord removed, his throat slashed and stitched together like a bloody boot, the fourteen-year-old boy had not been told that he had throat cancer and was expected to die. Small, a prize-winning children’s author, re-creates a life story that might have been imagined by Kafka. Readers will be riveted by his journey from speechless victim, subjected to X-rays by his radiologist father and scolded by his withholding and tormented mother, to his decision to flee his home at sixteen with nothing more than dreams of becoming an artist. 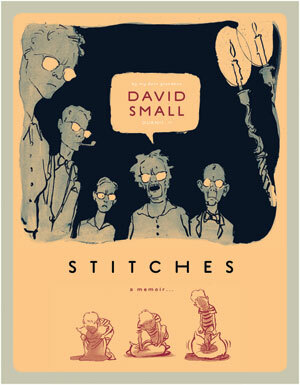 Recalling Running with Scissors with its ability to evoke the trauma of a childhood lost, Stitches will transform adolescent and adult readers alike with its deeply liberating vision. Here’s some brand new stuff coming out this Wednesday that is worth a look-see. You should be able to pick these up cold without having read anything else. See if something doesn’t grab your fancy. If so, follow the publisher links and you should be able to buy yourself a copy. Or, head to your local friendly comic book shop. Disclaimer: Having not read these yet (’cause this isn’t Wednesday), I can’t vouch for their quality. But, from what I’ve heard and seen, they just might appeal to you. New from the creator of Rex Libris comes The Warlord of IO & Other Stories. The main story in this comic centers on Jon Jett, an unstoppable, unopposable hero in the mold of Flash Gordon. In this opening adventure he comes up against the emperor Zing in a fun and funny space adventure, with plenty of political commentary tossed in for good measure! Also featured in this one-shot is Hell Lost, a social satire that follows the spiritual journey of Muktooth, a demon serving in Hell’s Police Department. Assigned to police crimes that exceed mandated punishment, as well as patron-on-patron (Hell is a service industry, after all!) related crime, he has a case book higher than Mount Everest! Video games, food, and sleep. These are the priorities, in that order, of Ethan MacManus, a twenty-something gaming enthusiast with a low tolerance for work, and a penchant for making up his own rules. Anything goes as Ethan and his best friend Lucas deal with life, pop culture, obnoxious customers, and more games than there are minutes in a day. Introducing the first collection of the much-sought-after webcomic, Ctrl+Alt+Del! Hillarious, sarcastic and funny in all respects, this collection includes 130 strips dating back to the epic beginning of the series. Characterized by an intriguing disjointed rhythm and delicious pencil-smudged style, The Bun Field is defined by a surreal ebb-and-flow, possessing a deep sense of foreboding and hurt, yet maintaining a biting sense of humor. 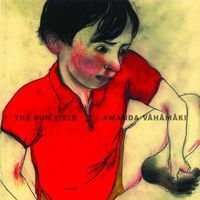 Amanda Vähämäki’s first graphic novel is infused with a sense of abbreviated adolescence and a kind of grey sky banality. A young girl dreams of a dinosaur eating Donald Duck; wakes to find a bald, hulking stranger sharing her breakfast; leaves to take a car trip with a bear; falls and breaks a tooth, to have it replaced from her dentist’s dog’s mouth; and pays back the favor by plowing a field of buns. Young people and anthropomorphic animals commingle in dreamy landscapes, performing mundane tasks that are skewed with an absurd and fantastic edge. Join us as we present comicdom’s first hero — Buck Rogers… the first man out of time… the first man to be taken out of his present environment and put into the future! In the tradition of such best-selling introductory Dynamite launches as Red Sonja and Battlestar Galactica, Dynamite is launching the all-original #0 issue for just 25¢! Under a John Cassaday cover (Cassaday serves as series cover artist), writer Scott (Batman) Beatty and artist Carlos Rafael present an original 12 page comic book adventure – ‘The Death of Buck Rogers’! This is where it all begins and Dynamite’s plans for Buck Rogers follow the model that they’ve followed over the years beginning with Red Sonja, embracing the history of such classic characters, but giving them a modern edge for today’s audiences! All this, and for a quarter to introduce you to the new canon of Buck Rogers! This adaptation of a Chinese folktale begins with a man’s dissatisfaction with his life. Weary of being a stonecutter, he becomes many things in his quest for authority, each time finding that greater power lies elsewhere. Rooted in Taoist principles, Stonecutter is an exquisite tale about self-acceptance. Originally published in a small, limited edition fifteen years ago, Jon J. Muth republishes the story because “Certain stories leave you with more than when they found you. They shed light on something, or unknot something for you, or offer some insight. At least they do for me. Stonecutter is one such story.” This inspiring tale pushes the boundaries and possibilities of graphic literature, and is now available for a new audience. What began among a small circle of friends in New York and San Francisco during the late 1940s and early 1950s laid the groundwork for a literary explosion, and this striking anthology captures the storied era in all its incarnations—from the Benzedrine-fueled antics of Kerouac, Ginsberg, and Burroughs to the painting sessions of Jay DeFeo’s disheveled studio, from the jazz hipsters to the beatnik chicks, from Chicago’s College of Complexes to San Francisco’s famed City Lights bookstore. Snapshots of lesser-known poets and writers sit alongside frank and compelling looks at the Beats’ most recognizable faces. What emerges is a brilliant collage of—and tribute to—a generation, in a form and style that is as original as its subject.